First FD4+. Karen Stewart Mary Gonzales Robin Buckham. Charlotte Fox. Cox. Cherylann Biegler. Congratulations to all APSM crews. Sorry no photos this time. Results from "Henley on the Maribyrnong Regatta" held 26th March 2017. Gold : FM4X+. Robin Buckham.Diana White. Lisa Letic. Annette Miller Cox. Eliza Hobba. (orange visa). Congratulations to everyone at APSM who competed at this regatta. Awsome effort from our APSM Rowers competing at the "World Masters Rowing Regatta" in Copenhagen at Lake Bagsvaerd over the weekend. Looking forward to hearing all about it when you get back. Annette Svanberg-Miller, Lisa Letic, Megan Boness, Diana White. Karen Stewart, Robin Buckham, Roslyn Nichol, Meredith Walker. Karen Stewart, Annette Svanberg-Miller, Mette Kræmmer Hansen,Robin Buckham, Roslyn Nichol, Diana White, Megan Boness, Meredith Walker. Cox Tommy Knudsen. Annette Svanberg-Mille, Roslyn Nichol, Lisa Letic, Megan Boness. The Octo had its first outing this morning with a great two laps of the Lake. We have discovered a few adjustments to be made that will improve the comfort of the row but all in all I am pleased to say that we managed to have a very successful outing. I would like to thank everyone who assisted in refurbishing and putting this boat together and in particular Allen, David, Daniel, Rick, Lu, James, Grace, Jo, Marie-Cecile, Roslyn, Robin, Siobhan for the many extra hours contributed so willingly. This has been a great team effort and hopefully once the trials have been finally completed the boat will be enjoyed by all! Getting ready! Allen relaxing before a hard workout. Appreciating the puddles , great teamwork! Octo Update: Painting Has Begun! The John Bartels has been sanded back and painting has begun on the inside of the hull. MC, Robin, Daniel, Lynne and Grace were all on hand to start the next stage of the project. Walter picked up some painting supplies and Robin found a new use for a sculling mirror. We are still looking for more volunteers to do the painting this week and rigging the week after. If you have some spare time over the next few weeks, please send your availability to Walter at Waltergrooten1@gmail.com. Further details are available on our Events Calendar. To read about Walter's Parisian adventures in an octo, please read our post. To see our photos, please visit our 2016 Working Bee photos. The January Working Bee is underway, summer is here and it's time to work off those Christmas kilos! 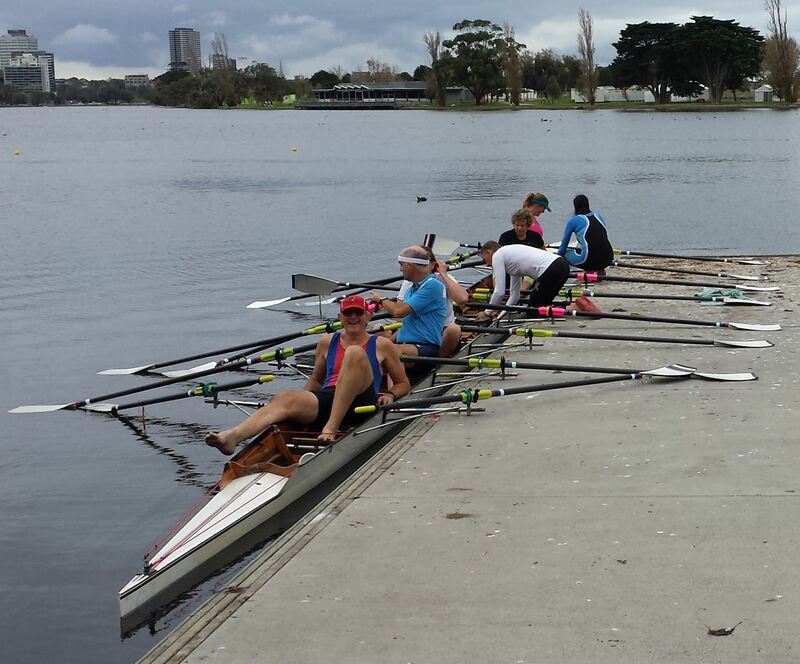 What better way to get back in shape than by entering the upcoming Ballarat and Barwon regattas? These will be held later this month on Saturday, 23rd January at Lake Wendouree and at Geelong over the weekend of 30th-31st. Club members can register their interest by logging in and visiting our Events page. See all the thrills of the 2015-16 season by visiting our Photos page. 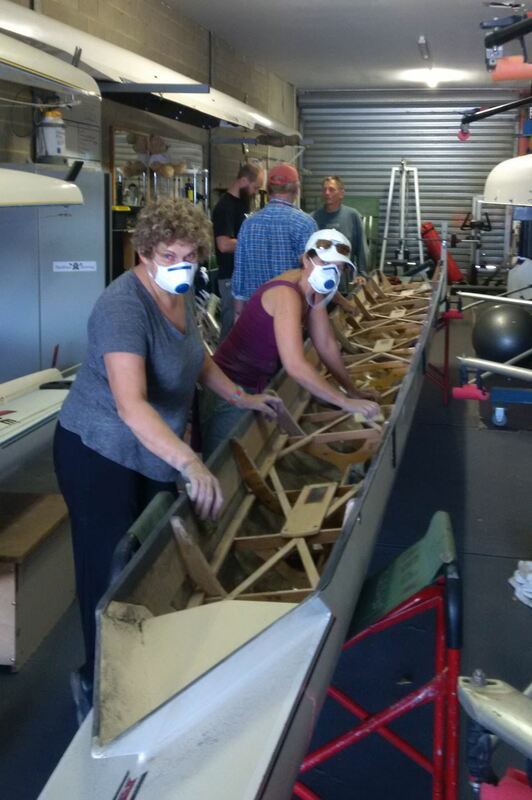 Work on converting the John Bartels into an octoscull continued last night as club members turned up to start sanding back the bow. This is expected to continue through Saturday and Sunday as we prepare for next week's painting. We are still looking for more volunteers to do the painting next week and rigging the week after. If you have some spare time over the next few weeks, please send your availability to Walter at Waltergrooten1@gmail.com. 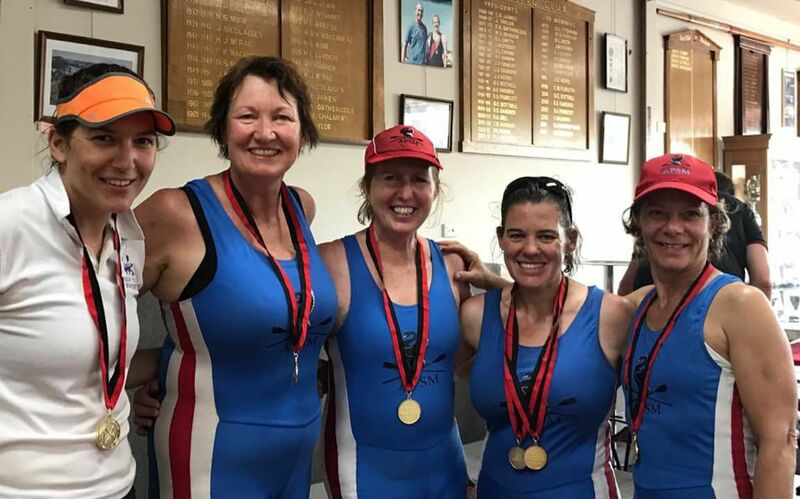 Seventeen APSM Members braved the heat at Nagambie last weekend to enjoy the first graded regatta of the season. Forty-four seats were raced in fours, quads, doubles, singles and the eight so APSM colours were a regular feature down the course throughout the day. Lynne, Ros, Robin and Sam coxed by Naimh were the first off in the FC4+. From all reports, they had a good row and came in fourth. Next was the F4X+ with two entries in different divisions, Ros, Siobhan, Ro and Lisa and coxed by Naimh were off first in what can only be referred to as a debacle. There were numerous delays and the strong cross winds meant the starters couldn’t get a line. The umpires decided on a running start, but only some crews got this news so APSM watched and was left behind. The starter tried again and even though no semblance of a line was achieved (with at least a couple of lengths between crews) the race started – somewhere. The results show APSM coming 6th with a very respectable time of 4:06 but we have no idea when the race and timing actually started! The other crew of Robin, Rachael, Lynne and Danielle (coxed by Magnus) had a less eventful start and finished fourth against some very strong competition and really demonstrated some promise for this crew which just came together on the day. Unfortunately, the long delays in the previous race meant that the MD4+ of Tom, Keir, Dan and Macson (who had to wait for their coxswain) missed their start. This was really disappointing for the boys who had won this event in Bendigo a few weeks ago. The crew rallied together and later hit the water to contest the MDX4+. This crew had some awesome competition with the winning crew coming in at a fast 3:30:27 and the boys finishing in a very strong time of 4:06:10. APSM fielded a strong contingent in the mixed doubles with Robin and Rick, Lynne and Daniel and Lisa and Michael all competing in different divisions. These races were great fun with everyone saying they enjoyed the experience. Next were Sam and Lisa in the singles, battling it out against each other over the 1K course. This was the first time for Lisa racing in a single on a straight course and she hit half a dozen buoys on the way down (she later said it was probably a symptom of hanging on for dear life). Sam rowed a really solid race and the two kept together the whole way down the course. In a close finish, Lisa held Sam off by a boat length before the two joined forces to contest the F2X, taking out third place. Rachael and Danielle also rowed the F2X and Rachel had a go at stroking with Danielle providing support and steering in the bow. It was great to see Rachel taking on this challenge as many avoid the seat. The last event of the day was the mixed 8 with Keir, Daniel, Robin, Siobhan, Rick, Michael, Ros and Ro with Niamh coxing. The crew had some very hot competition with the winning crew finishing in a time of 3:25:63 and APSM coming third. Overall, it was a very successful day with many members having a go at something for the first time and crew combinations giving people a chance to row with someone they wouldn’t normally have a chance to row with. It was a great day shared with friends. Well done APSM! D eight (stroked by O'Grady) pitted themselves against the clock over the 8.6km course. O'Grady's crew finished with the fastest time of the three at 35:42.54, after over-taking one crew and holding off a faster MUBC crew for 500m. Smiling faces turned up for boat unloading on Sunday, happy that head races are over for another season. Albert Park-South Melbourne Rowing Club has been awarded a $4,950 federal Community Heritage Grant to fund a Preservation Needs Assessment. The grant was announced at the National Library of Australia in Canberra on 27 October, 2015. This year, grants worth $438,710 have been distributed to 75 community groups and organisations from around Australia to assist in the identification and preservation of community owned but nationally significant heritage collections. Club member Grace Blake said the grant was important in supporting the effort to preserve the APSM Rowing Club collection at the grassroots level. “While the grant provides the funds, the assessment offers the expertise to help us protect our collection and make it accessible while it remains in the local context,” she said. “The Club is looking forward to completing the report, which will bring us one step closer to displaying fragile photographs, some of which date back to the 1890s”. This is the second Community Heritage Grant that the Club has won. Director-General of the National Library of Australia, Ms Anne-Marie Schwirtlich, said the CHG program showed the commitment by the National Library, along with its partner institutions and the Federal Government, in encouraging communities to care for the nation’s heritage, be it in small country towns or capital cities. CHG is managed by the National Library. It is funded by the Australian Government through the Ministry for the Arts; the National Archives of Australia; the National Film and Sound Archive; the National Museum of Australia and the National Library. For information regarding our previous Community Heritage Grant, please click here.